GST being a new architectural structure there are possibilities that tax payers tend to have complaints with the new habitat of changed taxation environment. And the council considered this aspect and introduced a GST complaint/ grievance redressal portal wherein taxpayers or complainee shall have answers to his questions under GST. The design of the portal is for lodging complaints by taxpayers and other stakeholders. Both taxpayers and stakeholders can lodge Complaint here indicating issues or problems faced by them while working on GST portal instead of sending emails to the Helpdesk. It has been designed in a manner that the user can explain issues faced and upload screenshots of pages where they faced the problem, for quick redressal of grievances. Based on selection of category/ subject and sub category, portal provides relevant FAQ/ pages of User manual to help the user resolve the problem faced by him. Step 1 : Enter the keyword related to issue / complain being faced by you in the "Type of Issue/Concern" box. 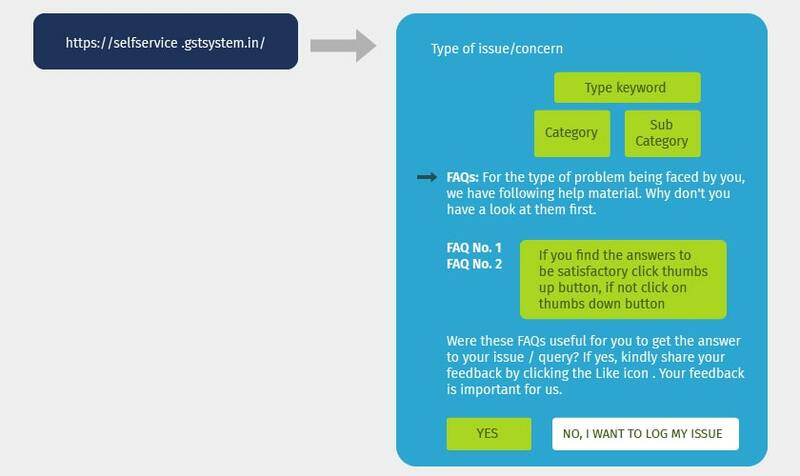 The system will search and show the list of all the issue with the entered keyword from which you can select the exact issue, after which the system will show the FAQ.s and relevant sections of User Manual related to that issue / complain. Step 2 : Go through the FAQ shown which may solve the problem faced by you. Step 3 : This step is cared when no match is found with the keyword entered by you. Then in all such cases, you can select the most relevant Category and Sub category from the dropdown boxes next to the box, "Type of Issue". Step 4 : This is when we move to lodging of complaint in GST when we don’t find answers to our solutions in these three steps : When FAQ.s do not help resolve the issue, then please select the button "No, I want to lodge my complaint" which will show the page to fill in the details to lodge the complaint. Step 5 : Obtain the ticket reference number of the complaint made by you which will be generated by the system after you lodge your complaint. This ticket reference number will be helpful in future date to track down the application status of the complaint lodged.